The taste of meatloaf but the speed of a skillet meal. I love meatloaf. Since Michael has been allergic to beef, meatloaf has been a trial. I attempted to make it with ground turkey in the beginning but that had unfavorable results. It just didn’t taste right and I’d rather go without than to eat that. Then I started low-carb diets and although I started making beef for me and the kids on occasion, I could no longer have the carbs that made it meatloaf. I purchased some hamburger on sale recently and decided to fix some of it for my lunch one day. 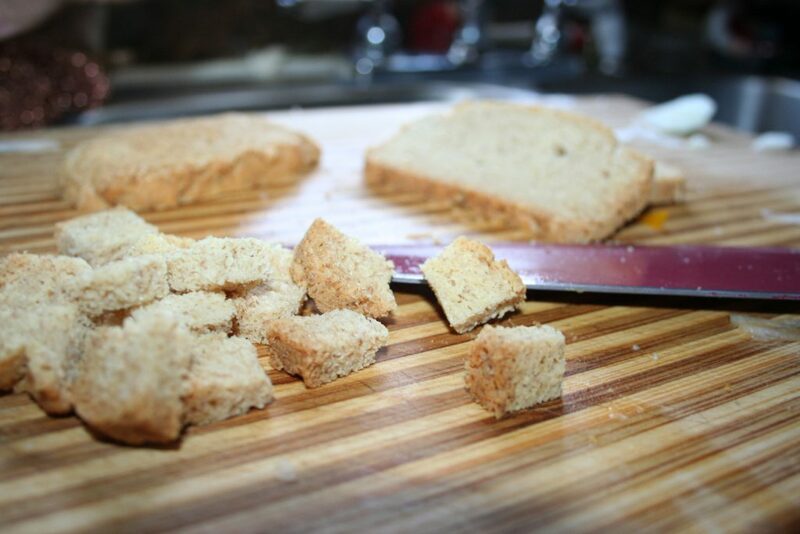 I had recently made some Swiss bread from the Trim Healthy Mama cookbook. 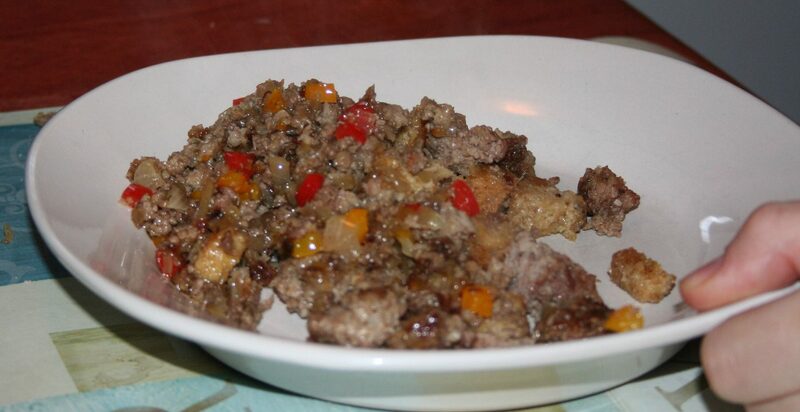 I had this idea to add a piece, cubed to my crumbled ground beef and I was shocked how much it tasted like meatloaf! Now, if I had a stove where the broiler were in a position that I did not have to practically lay down on the floor to put anything under it, I would put some sugar-free ketchup on it and broil it until it is browned a bit. So, without further adieu, here is how you make my Meatloaf Skillet. Dice up some onion and green pepper. 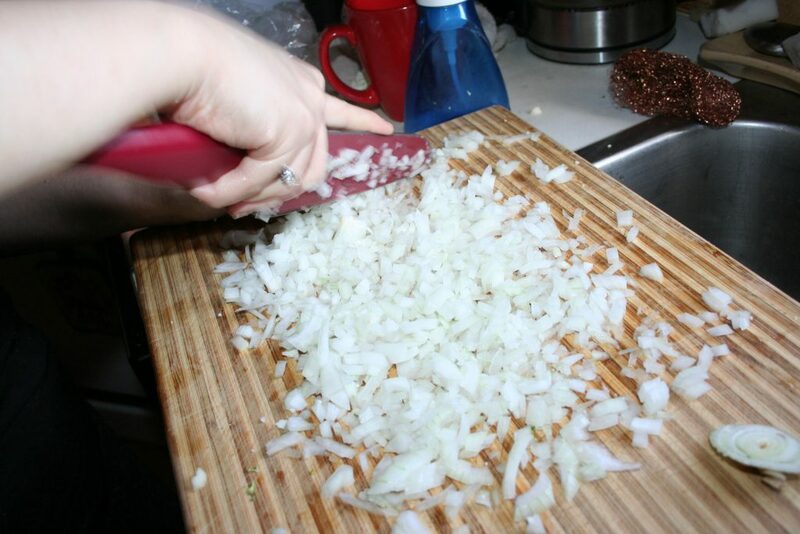 I would use a small onion and about a quarter to a third of a green pepper. 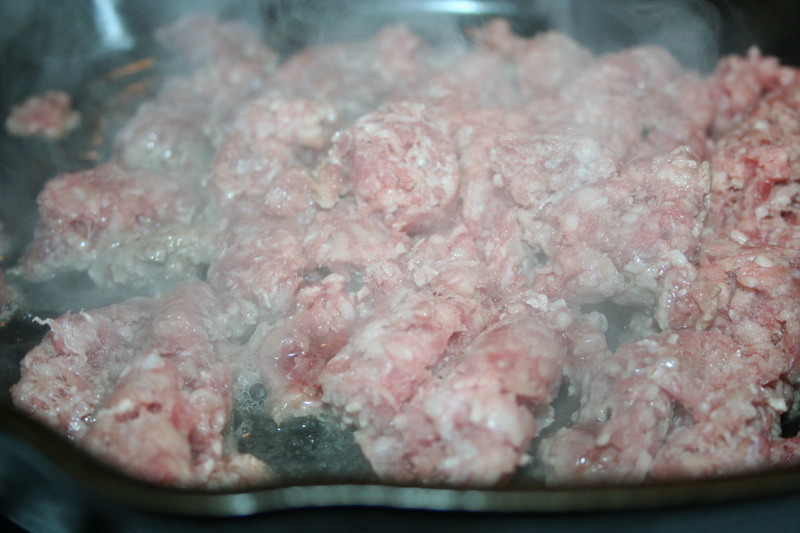 Add it with the ground beef to the skillet and brown it up. We didn’t have green pepper this day so we used some colored peppers. My daughter made this for me on my birthday, so she did it slightly differently than I would have. 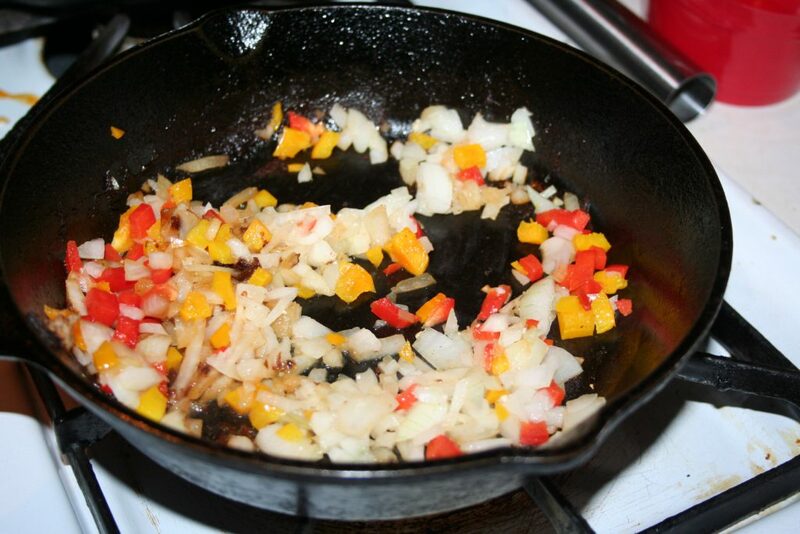 Save yourself pans to clean, just put it all in the skillet together with some salt. Next cube about a serving of swiss bread. You can make just one serving or make the whole loaf like I do and slice off a few pieces. Cut it into cubes and add it to the nearly finished browning meat. Let the bread cubes soak up a some of the fat released by the meat and then serve. These measurements are approximates, use more or less as you desire. Brown the meat with the onion, peppers, salt, and pepper. Add cubed bread, stir to combine. After a couple of minutes, remove from heat and eat. OPTIONALLY: Spread sugar-free (on plan) ketchup on top and put under the broiler until it is beginning to brown or the ketchup is thickened a bit. I totally love this dish! I see it in my future lunches often.